(Nanowerk News) In the fight against global warming, carbon capture – chemically trapping carbon dioxide before it releases into the atmosphere – is gaining momentum, but standard methods are plagued by toxicity, corrosiveness and inefficiency. 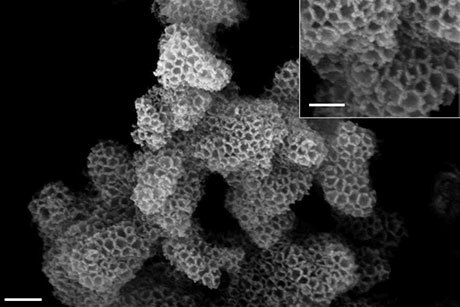 Using a bag of chemistry tricks, Cornell materials scientists have invented low-toxicity, highly effective carbon-trapping “sponges” that could lead to increased use of the technology. A research team led by Emmanuel Giannelis, the Walter R. Read Professor of Engineering in the Department of Materials Science and Engineering, has invented a powder that performs as well or better than industry benchmarks for carbon capture. 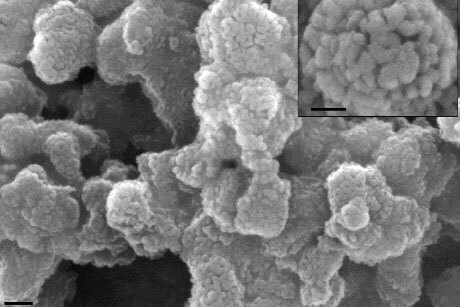 A paper with their results, co-authored by postdoctoral associates Genggeng Qi and Liling Fu, appeared Dec. 12 in Nature Communications ("Sponges with covalently tethered amines for high-efficiency carbon capture"). Used in natural gas and coal-burning plants, the most common carbon capture method today is called amine scrubbing, in which post-combustion, carbon dioxide-containing flue gas passes through liquid vats of amino compounds, or amines, which absorb most of the carbon dioxide. The carbon-rich gas is then pumped away – sequestered – or reused. The amine solution is extremely corrosive and requires capital-intensive containment. The researchers have been working on a better, safer carbon-capture method since about 2008, and they have gone through several iterations. Their latest consists of a silica scaffold, the sorbent support, with nanoscale pores for maximum surface area. They dip the scaffold into liquid amine, which soaks into the support like a sponge and partially hardens. The finished product is a stable, dry white powder that captures carbon dioxide even in the presence of moisture. Solid amine sorbents are used in carbon capture, Giannelis said, but the supports are usually only physically impregnated with the amines. Over time some of the amine is lost, decreasing effectiveness and increasing cost. The researchers instead grew their amine onto the sorbent surface, which causes the amine to chemically bond to the sorbents, meaning very little amine loss over time. Qi said the next steps are to optimize the sorbent and to eventually demonstrate it for industry, possibly at Cornell for retrofitting its power plant. He also said the technology could be used on smaller scale – for example, in greenhouses, where the captured carbon dioxide can be used to enhance plant growth. KyuJung Whang, Cornell’s vice president for facilities services, heard a presentation by Giannelis on the topic at a board of trustees meeting earlier this year.